To Cite: Shahmohammadi A, Taghipourzahir A, Azizi N, Ebrahimzadeh I. A Critical Reflection of the Appraisal Indicators of Distance Education Systems: A Meta-Synthesis, Interdiscip J Virtual Learn Med Sci. 2018 ; 9(2):e68103. doi: 10.5812/ijvlms.68103. Context: Promoting the quality of learning and teaching processes at the tertiary level, including distance education, has been considered as a strategic approach by policy makers in higher education, throughout the world. For this reason a reliable and comprehensive evaluation mechanism can play an important role in assessing the current situation and identifying the needs and problems from one hand and identifying the most important appraisal indicators on the other hand. This study aimed at critically reviewing the literature and theoretical frameworks of previous relevant researches to highlight the most important components and indicators that must be applied in appraising distance education. Methods: As a qualitative study, a meta-synthesis approach was applied. Due to the importance of using the findings of previous studies as a foundation for extracting the most important appraisal indicators, 42 national and international research studies relevant to the evaluation of distance education were selected and analyzed, which were published in refereed journals during year 2006 to 2015. The eligibility criteria for selecting these studies were their relevance to any aspect of distance education. For this reason and in order to identify indicators, the content of these studies were analyzed based on the open coding method. Later on, all findings were categorized, outlined, and summarized according to the main components, which may form a comprehensive evaluation system for distance education at the higher education level. Results: The findings of this meta-synthesis showed that pedagogical knowledge, technology, learning organization, educator, learner, learning content, teaching models and strategies, time, place and space were the most important components of a comprehensive appraisal system that should be considered in evaluating distance education systems and its mechanisms and processes, continuously. Conclusions: The rise of distance education in Iran’s higher education sector has urged that new comprehensive evaluation system has to be applied as a platform for improving and guaranteeing the quality of learning and teaching processes, curriculum and learning materials, and even the way by which these institutions are managed. Consequently, it is important to be assured that our policies and practices in higher distance education are on the right pathway. Therefore, based on the theoretical frameworks and studies performed before, the outcome of this meta-synthesis however, has highlighted some critical components which are necessary to be taken into account if this system has to be evaluated comprehensively. Higher education systems are considered as effective means in social development (1, 2), and are experiencing significant changes due to paradigmatic changes in economic and technological fields as well as the emergence of macro trends (3). These systems are no longer limited to ordinary classes (4). Since progress have been made in the use of electronic tools, education traverses traditional forms and moves towards e-learning and e-training. Distance education, which is a natural outcome of the inevitable use of digital instruments, is considered a modern approach that facilitates an educational process that is well-designed and equipped with multimedia technology to provide education for everyone, anywhere, and at any time (5). Due to the ever-increasing demand for distance education, the growth of this kind of educational system requires large amounts of funding to develop appropriate hardware and software platforms. On the other hand, the effective implementation of this educational system necessitates that policy makers, managers, and planners of the country be informed of the quality of results as well as the success rate of this system in achieving the desired goals, which requires continuous evaluation of its performance. Stalling believes that as the demand for distance education is increased, the emphasis on measuring its effectiveness and usefulness becomes a permanent requirement (6). Therefore, since the number and diversity of universities and institutions offering distance education has been expanding considerably over the past few decades, the emphasis on their evaluation system in different domains is felt more and more. The variety of indicators and components of evaluation, as well as the existence of various tools used in different studies, suggest that using them is one of the challenges of assessing distance education systems. This variety and diversity has led the evaluating individual or institution unable to focus on the specific factors of distance education system, thus, it has led the evaluation of distance education limited to certain factors. Therefore, the present study aimed at identifying the components and indicators commonly agreed upon in various studies with the aim of providing a comprehensive model for assessing distance education systems. However, the growth of information and communication technology (ICT) has brought about fundamental changes in the learning-teaching process (7), providing a critical bases for distance education systems so that equal and affordable education is available to various groups of people. As a result, interactive synchronous or asynchronous syllabus content has gradually become the dominant and dynamic method in all educational settings (8). Despite this, education systems have faced new challenges and demands, including the shift of the teacher-centered paradigm to the learner-centered paradigm, the emergence of virtual learning environments, transformation of time-place concept to a broader time-space concept, which has theoretically been justified by connectivism, such as Siemens (9). Siemens believed that despite developments in the field of teaching and learning, the education system has always been slow to recognize the impact of new learning tools and to identify the concept of environmental changes (10, 11). For this reason, a significant number of studies have been carried out on performance evaluation in distance education systems in the recent years, indicating the complexity of the evaluation process and the application of relevant findings for decision making. Islas et al. suggest that since the nature of distance education system is interdisciplinary, it is important for various specializations to be applied when the learning concept is theorized (12-15). While Douglas and Van Der Vyver emphasized the effectiveness of educational materials (16), Liu et al. focused on the availability and accessibility of this system (17), and Oztekin emphasized the usability of this system (18). For others, the most important factors that need to be addressed are learners, instructors, management and support, educational content and materials, training methodologies, time, place, quality of content, course organization, and usefulness of course subjects; interactions between these factors and components affect the evaluation of courses taught in this way (19, 20). Odunaike, Olugbara, and Ojo also found that proper planning components for preparing e-learning programs, support programs, training, collaboration and coordination, maximizing the use of Learning Management System (LMS) in curriculum development, and the development of online content are key factors when e-learning is practiced (21). Moreover, the appropriateness of existing content creation tools for the creation of electronic learning resources and content authoring tools have been highlighted by others as an important basis for assessing distance education system (22). Abdellatief et al. also examined “A technique for quality evaluation of e-learning from developers perspective” with a wider view and found that components, such as content presentation techniques, conveying methods, system functionality, usability, security, and user interface influence assessment of training practices of this system (23). Additionally, Abusneineh and Zairi sought a framework for evaluating the effectiveness of e-learning in a study with the same title, which aimed at identifying diverse perspectives in assessing the effectiveness of e-learning in the Arab World and concluded that it is necessary to focus on the pedagogical and technological aspects of e-learning system in order to evaluate this system (24). In brief, indicators, such as designing the environment for presenting educational content, management, teaching-learning support, organizational affairs, evaluation of educational progress, the manner of applying technology, support services, ethical considerations, and the degree of access to facilities of educational centers are effective indicators that need to be considered when distance education system is to be evaluated (25-27). Which factors and indicators have been highlighted as important basis for evaluation of distance education system, both by national and international studies? 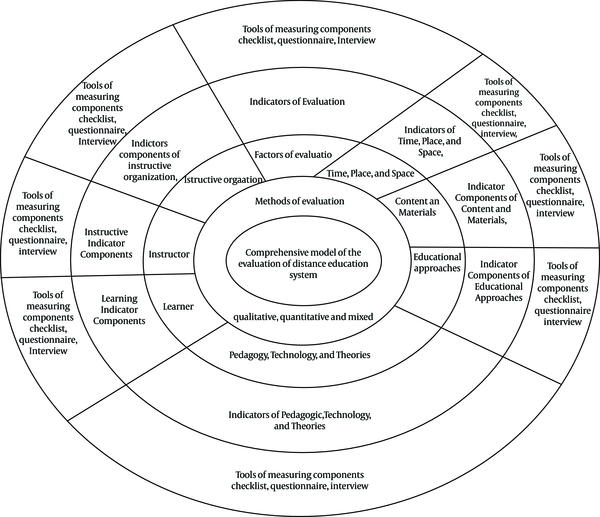 What does a comprehensive evaluation model for distance education systems look like (A conceptual model)? As a qualitative study, a meta-synthesis approach was applied. Via this protocol, researchers analyzed these studies and selected and extracted evaluation tools, components and indicators and combined and presented them in a framework for evaluation of the distance education system. Initially, theoretical and empirical foundations in the literature were used to collect data. Meta-synthesis is a type of research report, in which the researcher integrates a great deal of quantitative findings of first hand research studies; meta-synthesis is also a kind of qualitative study that examines information and findings extracted from other qualitative studies with a related and similar subject (28, 29). However, similar to meta-analysis, meta-synthesis is used to combine the specific characteristics of the research results. In order to implement the above-mentioned method, the 7-step method presented by Sandelowski Barroso (30) was used, according to Figure 1. Further explanations for each step are presented. In the first step of implementing the meta-synthesis method, the main research question should be identified. Therefore, in the introduction section of the paper, the research question was mentioned. Based on the research objectives and questions and using relevant national and international reliable databases, including Eric, Science Direct, Humanities Portal, and SID, 42 studies were found, which were published in refereed journals during years 2006 to 2015. These studies, which included 26 international and 16 national studies were the most relevant studies to the area of evaluation in the proposed research field. The main keywords that were used to identify aspects and dimensions of the conceptual evaluation model included distance education assessment, e-learning evaluation, index identification, online education evaluation, quality assessment, accessibility, learning measurement and assessment, evaluation tools in distance education, and evaluation checklist in distance education. At this stage, the content of these research studies were considered as data. Critically reviewed and content coding method was used for content analysis of data extraction. In order to assess the validity and reliability of eligibility criteria, the findings about indicators and components were checked and approved by the field experts. At this stage, after reviewing the abstract and the findings of the analyzed documents, 250 extra codes were extracted. The open codes were grouped together and then the axial codes were compiled. The number of pivot codes was 52. Then, the axial codes were placed together and the subsequent selection codes were extracted, which included seven dimensions. In the coding phase, the researchers focused on aggregating the categories or components of the overlapping assessment, as well as the broadness of the concepts, to extract the categories that were conceptualized and shared. Also, at this stage, the researchers looked at the dimensions that could cover other similar categories in the evaluation of the distance education system. Eventually, seven more organized codes were obtained that could cover all of the discussed categories. The coding results yielded 52 selective categories, which suggested that classified categories could cover the evaluation components. These selective codes are merged and presented in Table 1. To control the quality of this research, the purpose and research questions were the basis for decision making. Therefore, the documents reviewed by the top authors in this area, as well as the documents published by most authoritative publications in this area, were collected from data and citation databases. Pedagogical and technological foundations and theories Learning theories Pedagogical foundations and principles for designing courses, producing of materials and learning contents, applying relevant and proper teaching models and learning strategies as well as learning assessment in the distance education system based on behaviorists, cognitivists, constructivists and connectivism approaches. Evolution of learning technologies (generations) Correspondence training, radio and television training, computer-based education and Internet-based education. Theories of distance education Economic learning (cost-benefit analysis), the feasibility of training courses, independent learner, social construction theory, democratizing education and equality and equity in access to education, critical learners, cognitivism, connectivism and the growth of individual and social interactions, and highlighting cultural and social foundations in distance learning. Instructor Knowledge Familiarity with the effective interaction methods through e-mail, voicemail, chat rooms, etc. in a distance learning environment, familiarity with teaching methods, pedagogy, role of facilitating and supervising in the distance education system, proper and sufficient knowledge of English, familiarity with information technology, familiarity with various methods of student evaluation. Attitudes Highly motivated individuals entering the teaching profession in the distance learning environment, willingness to guide students to perform practical, theoretical, and complementary learning activities, having a positive attitude towards distance education. Skills Effective and continuous use of ICT during teaching of a course, referring students to sources beyond the resources provided in the course, assigning homework and various projects to students to strengthen learning, being skilled in online teaching, tangible presence in distance education environment, having the special skills required to create electronic content, continuous interaction with students and other components of distance education system, making use of varied media in online teaching, making use of reward and punishment methods during the training course, making use of diverse teaching methods and styles, having experience and specialty of faculty members in the related field of study. Instructive organization Infrastructures Information and communication technology, Internet speed and broadband, the availability of software and hardware, sufficient technological devices, high speed Internet and optical fiber, providing the possibility of communicating with other universities to receive counseling services in various fields, having proper bandwidth, providing high speed Internet, offering proper training software, providing computers, developing peripheral devices, such as printers and scanners in numbers proportionate to the number of students at the training center, existence of a counseling center to guide students in different fields, availability of educational facilities, such as laboratories and workshops, existence of learning management system, availability of proper graphic software, existence and production of novel and appropriate media and tools for training, boosting and updating databases. Management Qualified managers with deep knowledge, positive attitudes and required skills for effective administration in distance education, supporting professional environment, utilizing experts and specialists in the fields of design, planning, management, and network support, existence of proper planning discipline, guiding learners in the areas required, guaranteeing the quality of provided educational content, guaranteeing network security, existence of a proper technical support system throughout the course, management of an online financial system for paying fees, existence of an online center for admission and enrollment of learners, possibility of awarding a degree after completing the course, existence of an online student selection system, continuous and effective management of the virtual environment, making use of evaluation results to plan and improve the activities of upcoming educational courses. Logistics and services Helping learners solve potential technical problems during the course, continuous monitoring of the activities of professors and students throughout the course, confidentiality of information, existence of time schedule, noticing instructions, regulations, and announcements online, making use of learners’ and instructor’s opinions to improve educational system, guiding students and instructors step by step so that they can perform activities during training course. Evaluation Effective initial, formative and summative assessment in distance education system, implementing final evaluation to achieve goals, educational quality assurance, possibility of receiving immediate feedback during the course for continuous improvement and modification of the of educational system, self-assessment and adequate and proper assignments during the course and the possibility of giving immediate feedback to learners. Learner Knowledge Familiarity with effective interaction methods through e-mail, voicemail, chat rooms, etc. in the distant learning environment, familiarity with distance education system and relevant learning styles, proficiency in English language, virtual and ICT literacy. Attitudes Interest in distance education and motivation to participate in learning activities, positive attitude towards distance education, and having a strong belief in effectiveness of distance education. Skills Having necessary skills in information and communication technology, performing practical and complementary activities to strengthen learning, setting up regular contact with professors and other students in the virtual environment, being qualified in information and communication technology for the use of remote education, the ability to respond online, and online assigned activities. Learning content and materials Planning Guidelines and standards for the preparation, design, and delivery of learning materials or content, the availability of suitable technologies for the preparation, design, development, and delivery of learning materials or content. Designing The existence and use of teams consisting of faculty members, content specialists, designers and technical experts and assessment personnel for the preparation, design, and delivery of learning materials and content, use of student learning styles for the preparation, design, and delivery of learning materials and content. Production The use of scientific, educational and technical standards in the preparation, design, developing and delivery of learning materials and content, classifying educational and learning materials and content based on learning objectives and topics, clarifying learning behavioral objectives based on courses topics, the use of images, animations, videos and conceptual drawings in the provision, design, and delivery of learning materials and content, making use of multiple and diverse educational media (text, audio, visual, and multimedia), existence of diverse learning activities, emphasis on the content quality. Assessment Assessing learning contents that can be used for students’ self-learning, evaluating the process of authorship and designing content of materials, assessing the relevance of learning materials and content with the needs of professors and students, updating the content, selecting content that is appropriate for academic ability of learners, selecting content that is appropriate for learner needs, providing content based on the ability, time, and the extent of the progress of students, proper organization of training materials, accuracy and reliability of the content, using multiple resources, paying attention to standards and models for better selection of educational content and materials. Educational approaches Current educational practices Emphasis on varied learning talents and styles, ability to control learning progress, ability to record learning, existence of strategies for assessing and testing learners, emphasis on educational standards, developing appropriate and applicable training goals, appropriate curriculum planning tailored to the conditions and levels of learners, existence of systematic compiled planning, collecting information on goals and concepts and giving feedback to learners before the beginning of the course. Learner-based model Teachers as facilitators, independent learning, active learning environment, learners’ engagement in class, problem solving and inquiry-based learning and teaching. Multimedia-based model Educational technologies, educational hardware and software, web-based learning and teaching, mobile learning, social media and new learning and teaching models. Combined educational model Maximizing learning outcomes by merging all traditional and contemporary learning and teaching practices, paying attention to individual differences and individualizing learning and teaching strategies. Learning situation (place and space) Physical and virtual learning environment, virtual classes, virtual universities, e-library, learning virtual simulators e-books, etc. Various researches have shown that an effective evaluation system could improve the performance of an education system and its structure, processes, and practices at the end of the day. Despite this, none of them have identified effective appraisal indicators, comprehensively. The current study, therefore, attempted to fill this theoretical and empirical gap by identifying and merging the findings of previous researches on the most effective appraisal indicators and presenting them in a comprehensive evaluation model for distance education. As shown in Table 1, findings related to factors and indicators of evaluation conceptual model show that seven factors of pedagogical foundations, theories and technology generations, instructive organization, learner, instructor, learning content and materials, educational approaches, as well as time, place, and space are important aspects of the distance education system that must be evaluated. It is clear that the factors and components derived from this meta-synthesis can also be used for deeper understanding of the dimensions and characteristics of distance education and formulate a comprehensive evaluation model. As a result, the conceptual comprehensive model for evaluating distance education system consists of the above-mentioned seven groups of factors and their relevant indicators, which can be evaluated both qualitatively and quantitatively. Each of these factors include important and influential components that are crucial elements to be considered when distance education systems are to be evaluated effectively. This conceptual model are presented in Figure 2. With the development of Internet-based technologies and their greater access, distance education universities are on the rise in Iran’s higher education sector. However, this trend is more quantitative and its quality assurance needs to be assessed through an accurate and valid evaluation framework so that evaluators can use this framework to improve the educational quality of this kind of educational system. Therefore, as a meta-synthesis, the main purpose of this research was to highlight the components and indicators of the evaluation of distance education systems based on the theoretical frameworks and studies performed previously. Thus, the results of investigations, research methodologies, and tools for measuring distance education systems were compared based on these theoretical foundations, and seven factors were derived and extracted. Consequently, as shown in Figure 1, based on the analyzed research studies, a conceptual evaluation model was derived consisting of seven key factors and their relevant indicators, including pedagogical foundations, instructive organization, instructor, learner, learning content and materials, educational approaches and methodologies, as well as time, place, and space. Regarding “pedagogical foundations, theory and technological transformations”, it is worthy to mention that in an effective distance education system, the following components must be taken into account: Emerging pedagogical foundations, students’ learning styles and their individual differences, effective organization of the learning environment, teaching and learning goals, strategies and models with particular reference to technological advancements, specially paying attention to social media and Web-based learning opportunities, which have been approved by others (8, 24, 25, 31-36). Instructive organization was considered as another important factor to be evaluated in distance education. Via this factor, educational infrastructure, management, support, and protection of all elements of distance education are discussed. Additionally, resource allocation, establishing appropriate educational standards, and any other learning opportunities and facilities with close ties with other universities, and proper technical support system throughout learning system and other key aspects of distance education must be considered if this system is to be evaluated effectively. Similar findings were reported by previous studies (17, 23, 25, 27, 34, 36-44). In all learning theoretical foundations, the instructors were considered as major players, the role of whom in learning processes must be evaluated based on the relevant goals and objectives. Hence, the quality of their teaching performances is an important element when the quality of any educational practices is judged. This factor refers to different aspects of instructors’ professional and pedagogical qualification, capabilities, knowledge, and attitudes, which are also approved by other studies in the field of distance education (20, 23, 33-35, 37, 40, 42, 44-50). The current findings showed that the quality of educational content and materials are critical factors, which need to be evaluated in line with educational purposes and learning objectives, continuously. Educational content and materials, include a variety of formats, such as text, audio, image, multimedia etc. Similar to reviewed studies, the findings indicated that learning content and relevant packages are amongst the most vital components of the distance education system (18, 20, 23, 27, 35-38, 41, 42, 48, 49, 51-54). Therefore, assessing the quality of content, their relevance to learning objectives, accuracy and reliability of the content, their feasibility to teach in a distance educational environment and also the way these content and materials are organized, and so on is at the heart of modern educational systems. The sixth main factor that should be taken into account in a comprehensive evaluation model in distance education is educational approaches that are used in a wide range of educational activities. Since education in itself is a culturally diversified phenomenon, it is important for different educational methods must to be applied for creating an effective learning environment. For this reason, an effective and comprehensive evaluation model has to cover this factor and its relevant aspects, critically. The current findings showed that educational, geographical, social, economic, and even physical aspects of learners have not been taken into consideration sufficiently in current educational processes and practices, including learning styles, ability to control learning progress and records, and the application of diverse strategies for teaching and assessing students’ academic achievement. These findings are aligned with previous studies (20, 21, 23, 25, 43, 45-48, 55). The last factor focused on time, place, and space, which by nature are different in the distance education system compared with traditional education settings. In the distance education system, teaching practices are performed through online teaching using learning materials synchronously and asynchronously, which have been highlighted by previous studies as well (17, 18, 20, 23, 35, 38, 48-50, 56, 57). Therefore, it is important that a particular reference has to be given to these aspects of synchronous and asynchronous delivery of online learning services. Both theoretically and empirically, an efficient and inclusive assessment model is regarded as a strategic and integrated part of any education system, which can help improve the organizational performance from one hand and modification of the system’s shortcoming and weaknesses on the other hand. Therefore, it is very important for assessment procedures and evaluation mechanisms to be both contextualized and revised continuously. However, unlike all other studies that have tried to consider only a specific aspect or dimension of distance education settings in an attempt to evaluate this learning environment, this meta-synthesis study attempted to introduce a comprehensive conceptual evaluation model for distance educational context by combining findings of all theoretical and empirical studies in this field. Based on this analysis, a comprehensive evaluation model is a multifaceted process, in which the above-mentioned factors and their relevant indicators should be taken into account as a whole. However, the current findings suggest that the conceptual evaluation model cannot work in vacuum and its effectiveness is limited unless it is instantly replaced and revised in practice to determine its applicability and efficiency. It is also worthy to mention that this evaluation model should not be only seen for learning outcomes in Payame Noor University as a provider of distance education, yet its application has to be extended to other key areas, such as designing, developing, and maintaining distance education institutions as well as any other form of education settings, in which e-learning is a dominant form of learning and teaching practices. The authors thank the senior officials at the Central Headquarter of the Payam-e Noor University, professors, researchers and other colleagues at other provincial branches of the university, who provided insight and expertise that greatly assisted the research. Indeed, the comments of the anonymous referees were helpful in subsequent revision and redirecting of the paper. Authors’ Contribution: Basically, the initial idea for carrying out this research was suggested by Anwar Shahmohammadi as a PhD student, yet in a collective process, Dr. Taghipour, Professor Azizi and Dr. Ebrahimzadeh also contributed to the design and implementation of the research, analysis of the results, and writing of the manuscript. Conflict of Interests: This article was extracted from a PhD thesis in Higher Education Management Science and Research Branch, Islamic Azad University. 1. Fitzpatrick J, Sanders L, Worthon B. Program evaluation: alternative approaches and practical guidance. Boston: Allyn & Bacon Press; 2011. 2. Castello-Climent A, Hidalgo-Cabrillana A. The role of educational quality and quantity in the process of economic development. Economics of Education Review. 2012;31(4):391-409. doi: 10.1016/j.econedurev.2011.11.004. 3. Azizi N. [Reflecting on challenges facing the secondary education in relationship to job market]. Q J Educ. 2013;28(4):99-128. Persian. 4. Wang Y-S, Wang H-Y, Shee DY. Measuring e-learning systems success in an organizational context: Scale development and validation. Comput Hum Behav. 2007;23(4):1792-808. doi: 10.1016/j.chb.2005.10.006. 5. Comerchero M. E-learning concepts and techniques. USA: Institute for Interactive Technologies, Bloomsburg University of Pennsylvania; 2006. 6. Stallings D. Measuring success in the virtual university. J Acad Librarian. 2002;28(1-2):47-53. doi: 10.1016/s0099-1333(01)00300-7. 7. Eskandari H, Fardanesh H, Sajadi. M . Connectivism: in competing for or in alignment with other learning theories? J Edu Psychol. 2010;5(15):35-64. 8. Ghasemi AR, Shahriarifard A. Identification and prioritization of indicators involved in the quality of electronic education. J Tech Educ. 2015;10(4):307-18. 9. Rezaei I, Nasri S, Armand M. [Communication theory and its application in the design of the academic textbook]. Ayar. 2011;(24):81-94. Persian. 10. Siemens G. Connectivism: A learning theory for the digital age. Int J Instr Tech Dist Learn. 2005;2(1):25-39. 11. Islas E, Perez M, Rodriguez G, Paredes I, Avila I, Mendoza M. E-learning tools evaluation and roadmap development for an electrical utility. J Theor Appl Electron Commerce Res. 2007;2(1):61-75. 12. Yengin I, Karahoca A, Karahoca D. E-learning success model for instructors’ satisfactions in perspective of interaction and usability outcomes. Procedia Comput Sci. 2011;3:1396-403. doi: 10.1016/j.procs.2011.01.021. 13. Mohammadi R, Zafaripour T, Sadeghimandi F, Zamanifar M. [Accreditation and quality assurance of distance learning: A review on patterns and processes]. J Edu Meas Eval Stud. 2015;4(8):95-137. Persian. 14. Arbaugh JB, Benbunan-Fich R. The importance of participant interaction in online environments. Decis Support Syst. 2007;43(3):853-65. doi: 10.1016/j.dss.2006.12.013. 15. Douglas DE, Van Der Vyver G. Effectiveness of e-learning course materials for learning database management systems: An experimental investigation. J Comput Inform Syst. 2004;44(4):41-8. 16. Liu G-Z, Liu Z-H, Hwang G-J. Developing multi-dimensional evaluation criteria for English learning websites with university students and professors. Comput Educ. 2011;56(1):65-79. doi: 10.1016/j.compedu.2010.08.019. 17. Oztekin A. A decision support system for usability evaluation of web-based information systems. Expert Syst Appl. 2011;38(3):2110-8. doi: 10.1016/j.eswa.2010.07.151. 18. Kanuka H, Anderson T. Ethical issues in qualitative e-learning research. Int J Qual Meth. 2016;6(2):20-39. doi: 10.1177/160940690700600204. 19. Ekmekci E. Distance-education in foreign language teaching: evaluations from the perspectives of freshman students. Procedia-Soc Behav Sci. 2015;176:390-7. doi: 10.1016/j.sbspro.2015.01.487. 20. Dorobat I. 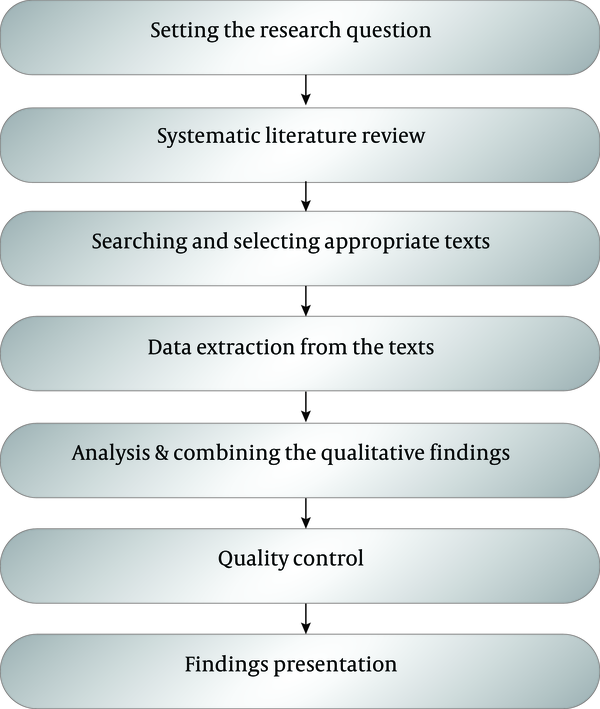 Models for measuring e-learning success in universities: A literature review. Inform Economica. 2014;18(3/2014):77-90. doi: 10.12948/issn14531305/18.3.2014.07. 21. Hand A. Evaluating the suitability of current authoring tools for developing e-learning Resources [Dissertation]. 2012. 22. Abdellatief M, Sultan M, Jabar M, Rusli A. A technique for quality evaluation of e-learning from developers perspective. Am J Econ Bus Admin. 2011;3(1):157-64. doi: 10.3844/ajebasp.2011.157.164. 23. AbuSneineh W, Zairi M. An evalution farmework for e-learning effectivenss in the Arab world. International encyclopedia of eduction (Third Edition). 2010. doi: 10.1016/B978-0-08-044894-7.01708-5. 24. Anarinejad A, Mohammadi M. The practical indicators for evaluation of e-learning in higher education in Iran. Interdiscip J Virtual Learn Med Sci. 2014;5(1):11-25. 25. Jahanian R, Etebar S. [Evaluating the status of virtual education in e-learning centers of Iran's universities from the viewpoint of students]. Inform Comm Tech Edu Sci. 2012;2(4):53-65. Persian. 26. Javadi B, Ebrahimzade E, Farajollahi M, Sarmadi MR. [Designing an effectiveness assessment model for distance education system in Payame Noor University]. Q J Inform Comm Tech Edu Sci. 2011;2(1):80-98. Persian. 27. Bench S, Day T. The user experience of critical care discharge: a meta-synthesis of qualitative research. Int J Nurs Stud. 2010;47(4):487-99. doi: 10.1016/j.ijnurstu.2009.11.013. [PubMed: 20004396]. 28. Cresswell JW. Educational research, planning, conducting, and evaluating quantitative and qualitative research. Boston: Pearson Education, Inc; 2012. 29. Sandelowski M, Barroso J. Handbook for synthesizing qualitative research. Springer Publishing Company; 2006. 30. Munyoka W, editor. Evaluation impact of tele-education as new open distance learning delivery mode on Learners in Botswana. 5th World Conference on Educational Sciences - WCES 2013 - Procedia-Soc Behav Sci. 2014. p. 1248-52. 31. Masoumi D, Lindstrom B. Quality in e-learning: a framework for promoting and assuring quality in virtual institutions. J Comput Assist Learn. 2012;28(1):27-41. doi: 10.1111/j.1365-2729.2011.00440.x. 32. Erdogan Y, Bayram S, Deniz L. Factors that influence academic achievement and attitudes in web based education. Int J Instruct. 2008;1(1):31-47. 33. Islam MA, Abdul Rahim A, Tan CL, Momtaz H. Effect of demographic factors on e-learning effectiveness in a higher learning institution in Malaysia. Int Educ Stud. 2011;4(1). doi: 10.5539/ies.v4n1p112. 34. Akbary Boorang M, Jafari Sani H, Ahanchian MR, Kareshki H. [The evaluation of e-learning quality of iran’s universities based on curriculum orientations and faculty members’experiences]. Q J Res Plan High Edu. 2013;66(1):75-97. Persian. 35. Seraji F. Providing a framework for evaluating education quality at e-colleges. Fifth Education Quality Assessment Conference on Academic System. May; University of Tehran, Technical Schools Campus. 2011. 36. Orehovacki T, Granic A, Kermek D. Evaluating the perceived and estimated quality in use of Web 2.0 applications. J Syst Software. 2013;86(12):3039-59. doi: 10.1016/j.jss.2013.05.071. 37. Oztekin A, Delen D, Turkyilmaz A, Zaim S. A machine learning-based usability evaluation method for eLearning systems. Decis Support Syst. 2013;56:63-73. doi: 10.1016/j.dss.2013.05.003. 38. Pazalos K, Loukis E, Nikolopoulos V. A structured methodology for assessing and improving e-services in digital cities. Telematics Informat. 2012;29(1):123-36. doi: 10.1016/j.tele.2010.05.002. 39. Savic, S , Stankovic, M , Janackovic, G . Hybrid model for e-learning quality evaluation. The Second International Conference on e-Learning (eLearning-2011). 29-30 September 2011; Belgrade, Serbia. 2011. 40. Ozkan S, Koseler R. Multi-dimensional students’ evaluation of e-learning systems in the higher education context: An empirical investigation. Comput Educ. 2009;53(4):1285-96. doi: 10.1016/j.compedu.2009.06.011. 41. Khodabakhshi A, Movahed Mohammadi H, Shabanali Fami H. [Analysis of components of quality of e-learning in the Iranian agricultural higher education]. Iran J Agr Econ Dev Res. 2014;44(4):693-707. Persian. 42. Hasanzade A, Karimzadegan Moghadam D, Motaghian H. [Assessing the factors influencing university instructors adoption of web-based learning systems using an integrated model]. Manag Res Iran. 2013;17(1):41-72. Persian. 43. Darab B, Montazer G. [Designing an electronic learning readiness assessment model in Iranian universities]. Sharif J Ind Eng Manag. 2009;1(1):21-30. Persian. 44. Iskenderoglu M, Iskenderoglu TA, Palanci M. Opinion of teaching staff in distance education systems, regarding the assessment and evaluation process. Procedia-Soc Behav Sci. 2012;46:4661-5. 45. Karal H, Cebi A. Views on modular assessment and evaluation process in distance education. Procedia-Soc Behav Sci. 2012;46:2073-7. doi: 10.1016/j.sbspro.2012.05.430. 46. Fariborzi E, bt Abu Bakar K. Factors influencing the effectiveness of courses in Iranian university e-learning centers. Int J Tech Knowl Soc. 2010;6(1):71-80. doi: 10.18848/1832-3669/CGP/v06i01/56057. 47. Norollahy S, Hakimzadeh R, Seraji F. [Evaluation of instructional design quality of e-learning courses of hadith science college]. High Educ Lett, New Edition. 2012;5(17):119-35. Persian. 48. Hadadian A. [Surveying national e-learning system in the globalization era]. J Strat Stud Publ Pol. 2011;2(4):117-48. Persian. 49. Enayati Novinfar A, Uosefi M, Siyami L, Javaheri Daneshmand M. [Evaluation of the quality of education services of Payam Noor University of hamedan based on the SERVQUAL model]. Q J Res Plan High Edu. 2011;17(3):135-51. Persian. 50. Hassanzadeh A, Kanaani F, Elahi S. A model for measuring e-learning systems success in universities. Expert Syst Appl. 2012;39(12):10959-66. doi: 10.1016/j.eswa.2012.03.028. 51. Kay R. Evaluating learning, design, and engagement in web-based learning tools (WBLTs): The WBLT evaluation scale. Comput Hum Behav. 2011;27(5):1849-56. doi: 10.1016/j.chb.2011.04.007. 52. Caramihai M, Severin I. Elearning tools evaluation based on quality concept distance computing. A case study. World Acad Sci Eng Tech. 2009;29::569-73. 53. Kazemi Ghareche M, Amin Khandaghi M, Jafari Sani H. [The evaluation of quality of e-content development stages in curriculum of Mashhad University of Medical Sciences in 2011]. Q J Edu Manag Eval Stud. 2013;3(3):71-99. Persian. 54. ECOTEC E Learning Evaluation. Final evaluation of the e-learning programme: Annex to the joint report. Birmingham, United Kingdom: Priestley House; 2007. 55. Pohl M, Rester M, Judmaier P, Stockelmary K. Ecodesign - design and evaluation of an e-learning system for vocational training. E & I: Elektrotechnik und Informationstechnik. 2005;122(12):473-6. doi: 10.1007/bf03054382. 56. Ardito C, Costabile MF, Marsico M, Lanzilotti R, Levialdi S, Roselli T, et al. An approach to usability evaluation of e-learning applications. Univers Access Inform Soc. 2005;4(3):270-83. doi: 10.1007/s10209-005-0008-6. 57. Zarei A, Mohd-Yusof K, Daud MF, Azizi N. Web 2.0 applications for engineering education: Faculty members’ perception, barriers, and solutions. Comput Appl Eng Educ. 2017;25(3):449-57. doi: 10.1002/cae.21812.